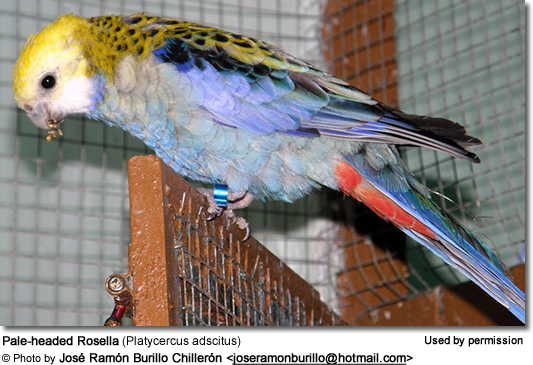 The Pale-headed Rosella (Platycercus adscitus) is a colorful, moderate-sized parrot that is native to Australia. In 1877, they were introduced to Hawaii, USA, but have since died out (by the late 1920s). 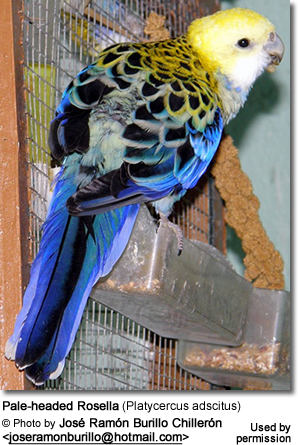 These striking rosellas are popular in aviculture and as pets. 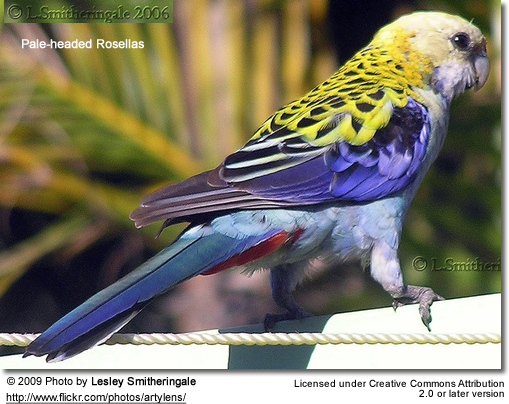 The Pale-headed Rosella is also sometimes referred to as Mealy Rosella, Moreton Bay Rosella and Blue Rosella. 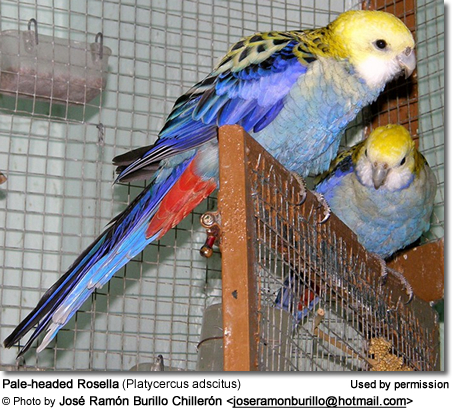 The northern, nominate race is also known as Blue-cheeked Rosella, named for the blue feathers on its cheeks; however, it is not part of the Blue-cheeked Rosella group. 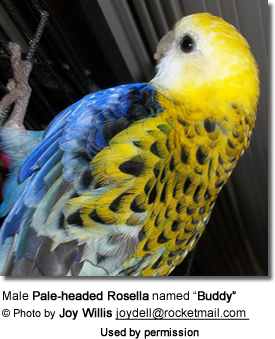 The name "White-cheeked Rosella" has been used for both the Pale-headed and Eastern Rosella species. 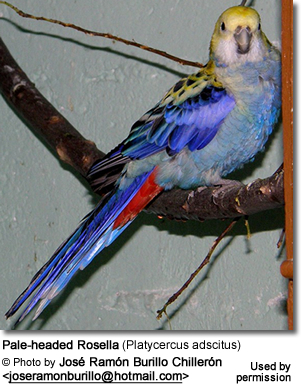 The Pale-headed Rosella forms a *superspecies with the Northern Rosella (Platycercus venustus) found in the northern regions of the Northern Territory (second northernmost point in Australia) and the Eastern Rosella (Platycercus eximius) found in southeastern Australia. (*Superspecies are closely related species with non-overlapping distributions; they are thought to have evolved from the same species). All three are sometimes considered conspecific (one and the same species). Range: The more northerly race occurs from Cape York Peninsula (in Far North Queensland - the most northern part of Australia) south to northeastern New South Wales. 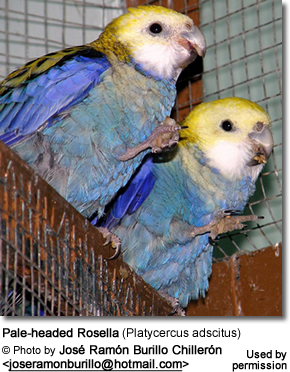 ID: The plumage show very little of the yellow wash that can be seen on the subspecies. Range: South-eastern Queensland - south of the town of Innisfail - south to northern New South Wales (eastern Australia) to the vicinity of the Clarence River. ID: Slightly larger in size. Plumage is much more yellow than that of the nominate race. The nominate race and the subspecies have been recorded to hybridize (interbreed) in areas where their ranges overlap - in northeastern New South Wales and southeastern Queensland. The Pale-headed Rosellas occur naturally along the northeastern and eastern seaboard of Australia, from Cape York throughout most of eastern Queensland to Southern New South Wales. They are mostly absent from the more arid (drier) interior regions. They are considered to be "resident" (non-migratory) and its population is reported to be abundant throughout much of its range (del Hoyo et al. 1997). They mostly occur in open, savanna woodland and dry forest dominated by Eucalyptus and Callitris, Casuarina, Acacia and Melaleuca trees; often along water courses. However, they have adapted well to human-modified habitats, such as gardens, parks and farmland. They often visit local bird feeders, or feed in fruit and nut orchards and on agricultural lands. This medium-sized parrot averages 28 - 34 cm (11 - 13 inches) in length (average: 12 inches / 31 cm). They weigh between 3.3 - 5.3 oz (95 - 150 g) - average: 4 oz / 110 g.
The head and throat is mostly whitish / pale-yellow, with exception of the nominate race which may have bluish cheeks. The chest and abdomen are blue to deep blue with a yellowish-white tinge. The feathers on the chest and belly have a fine dark edging. The back of the neck and back feathers are black with yellow edging. 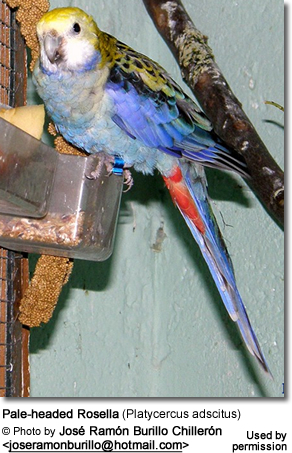 The lower back and upper tail feathers (coverts) are bluish-green. The black shoulder feathers are edged greenish-blue and yellow. There is a white wing-stripe on the underside of the wings (off-white in the female). Males and females look mostly alike; except the males tend to be slightly larger, and the females often have a paler underside and her bill is somewhat smaller. Sexing young birds can prove difficult and DNA sexing may be the only way to know their gender for sure at a young age. However, birds at least 9 months or older could possibly be visually sexed, as they start molting into their adult plumage. Young birds resemble adults, except for a duller plumage. The back of the head and neck (nape) often have a few scattered red feathers. The underwing stripe is paler in the juvenile. 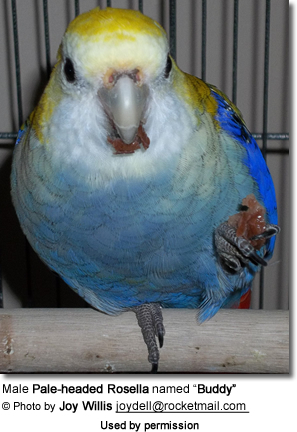 Young birds attain the adult coloration when they are 12 to 16 months old (after their second molt). 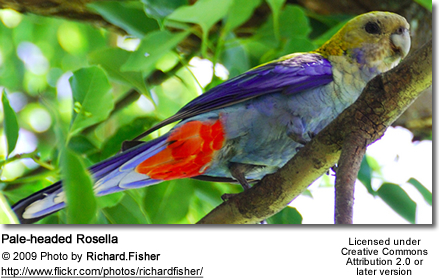 The Pale-headed Rosella is similar to the closely related Eastern Rosella, which can be easily be identified by the bright red head and upper chest, compared to the pale yellow head of the Pale-headed Rosella. Their calls are similar. The two species are known to hybridize in areas where their ranges overlap - leading to offspring with blended characteristics. Pale-headed rosellas are often noisy, except when feeding, which is typically done in silence. When roosting in groups, soft chattering or high pitched rapid 'pi-pi-pi-pi-pi' contact calls can be heard. Their alarm calls are shrill and screechy. In flight, they make 'kwik, kwik' vocalizations. Rosellas are generally not known for much talking ability but they can mimic whistles and songs. 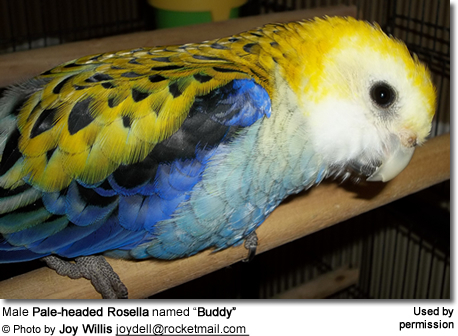 This being said, some gifted birds learned to talk, such as 2-year old "Buddy" (featured above and below). He says "come here," "what you doing," and "oh no". He also barks like a dog, rings like a cell phone, and laughs like his owner's husband. Buddy likes to ride on his owner's shoulder, plays with the dogs, and loves to roll in the blankets on the bed. In their natural habitat, they mostly feed on grass and tree seeds (including sprouted seeds that dropped to the floor and were exposed to humidity), flowers, various fruits, including the fruits (and potentially foliage) of the River Red-gum (Eucalyptus camaldulensis), River Sheoak (Casuarina cunninghamiana), melaleucas trees and Rough Cockleburr (Xanthium strumarium). They also feed on the flowers of the introduced Scotch Thistle (Onopordum acanthium). Their diet also includes a variety of berries and nectar. Northern birds usually breed between September - January, while those found in the southern areas, mostly breed between February to June. 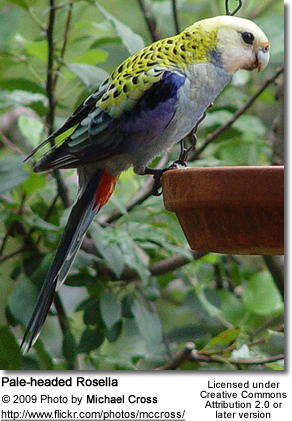 Wild Pale-headed Rosellas usually nest near water, in the cavities of either dead or living trees, usually in eucalypts, or hollow stumps and posts. The nesting cavity is usually over 3 feet (1 m) deep and located up to 100 ft (30 m) above the ground. The nest floor is usually covered with wood dust. The female alone incubates the eggs while the male feeds her and helps providing food for the young. In the wild, they usually produce 1 - 2 broods a season. Pale-headed Rosellas can be expected to live 15 or more years. Females reach reproductive maturity when they are about 18 months old, while males are able to successfully breed when they are 2 - 3 years old.